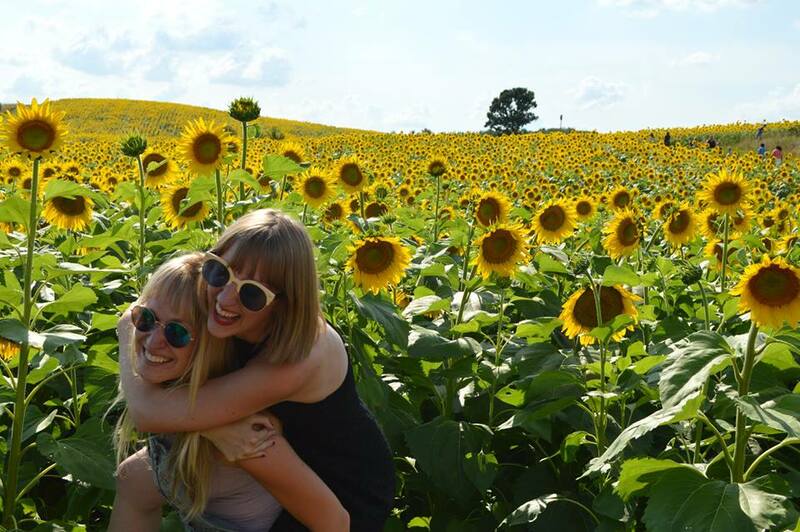 Over the summer, I've done a lot of things that were completely out of my comfort zone. Many of them were for my internship; some were for myself. Instead of staying in and binge-watching The Office (I blame some of my introvert side on Netflix) or reading The Perks of Being a Wallflower for the 48th time, I forced myself to do things I wouldn't normally do. I went to a music festival and channeled my inner hippie, I played kickball with a group of friends I didn't know, I explored a city I don't know well at all. And through all of these things, I found that getting out of my comfort zone is, for the most part, rewarding and fun. If the show Girls taught me anything, it's that magic happens outside of your comfort zone. This is the easiest part. That guy that keeps asking you to join his mini-golf league? Say yes! That girl who wants to get mani-pedis? I know you think it's bogus to spend money on something you're just going to chip off upon returning home, but it could be a great bonding experience. Be open to things you once thought silly, juvenile or scary. It's tempting to stay home, make a frozen pizza and surf the web for hours, but put that off for a night. Try saying yes. Stop ignoring your phone that's been buzzing all night. You agreed to the plans - now follow up. This is always something I struggle with. It's one thing to accept an invitation, it's another to actually show up. I know it can be terrifying trying something new or not knowing anyone. For me, I have to remember people are just people. If I'm nice to them, chances are, they will be nice to me. To make this easier, ask one of your friends to introduce you to someone else beforehand, or have a friend drive with you. If neither of these work, just remember to smile and breathe. You won't have any fun at the event if you're texting the whole time or if you don't actually try whatever it is you're doing. 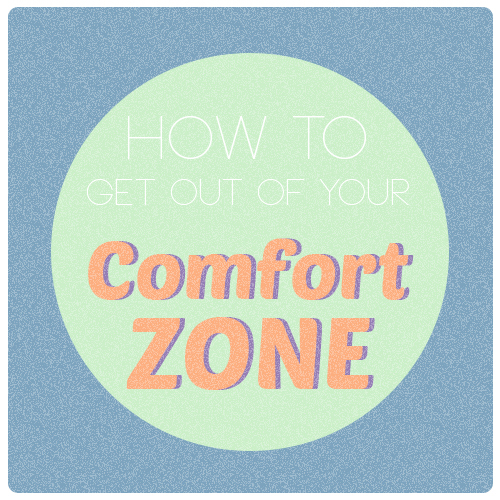 This is the key step in getting out of your comfort zone. You accepted the invitation, you're there, now do. To get the full experience, you must immerse yourself. Soon you'll find you're enjoying yourself and have a great story to tell afterward (and possibly blog about *wink*). Don't deny yourself the fun you'll be having. Somewhere during your adventure, you'll realize it wasn't a hassle or nearly as scary as you thought it would be. You'll want to retract and not admit to yourself how easy and effortless it was to have so much fun. Don't give your mind the pleasure of agreeing with yourself. Realize how much fun you're having and remember it for the next time you're asked to do something out of your comfort zone. You did it. Every step. Be excited for yourself! 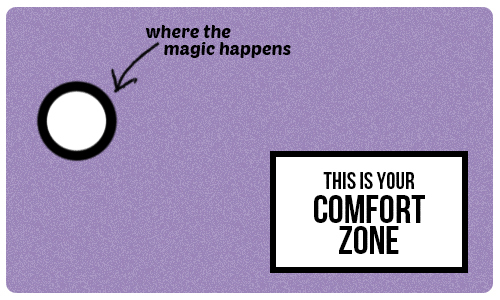 Getting out of your comfort zone isn't easy, but it always feels so good when you do. Revel in this thought. Give yourself a big pat on the back. Blast your favorite music on the car ride home. Think about how much fun you just had and how easy it was. Be proud. Now that your day is over, don't forget to do something you love to recharge. Watch Parks & Recreation season 3 episode 14 for the 100th time and quote the whole thing. Drink a delicious Diet Coke while reading the new Chuck Klosterman novel. Knit. Play music. Write. Now is the time to settle into your recluse ways - but don't stay there too long, your phone could be ringing any moment with another awesome opportunity.